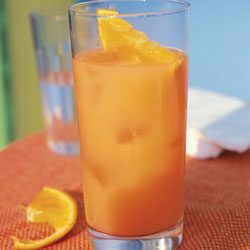 In a cocktail shaker over ice, combine rum, orange juice, grenadine, lime juice, and syrup. Shake well, then strain into a tall glass over ice. Garnish with an orange slice. Easy to enlarge the quantities to fit your crowd.